Duane was born to Mildred and Ralph Dye on September 23, 1932 in Stanton, Nebraska. He was raised on the family farm, along with his sister Carol, near Pilger, Nebraska and that farm remains in the family today. Growing up in Nebraska always held a special place in Duane’s heart, even though he left Nebraska for California in 1957. When Duane was 17 years old he contracted polio which was sweeping through the Midwest and ultimately, leaving the cold and difficult weather that Nebraska offered was what Duane needed. His determination allowed him to champion the physical difficulties that the polio presented and after attaining his college degree in Accounting, he left Nebraska for California. When he arrived in California he took a job at Wayside Honor Farm in Castaic, working as a supervisor within the Accounting Department. At the same time he was working at the Honor Farm, he was developing income tax clientele which ultimately led to him starting his own insurance agency, Duane Dye Insurance, in Newhall. The area of Newhall was a community of only 15,000 people and it was on the cusp of great growth. Duane Dye Insurance is still a vibrant insurance agency in the Santa Clarita Valley today. Duane married his wife Linda, in August of 1965, taking on not only a wife but a wife with three children, Lori, Luanne & Larry. Duane and Linda added another sibling, Jef, to the family in 1968. Between running a business and raising a family, Duane was an active member of the Newhall Rotary Club and a member of the Baha’i Faith. 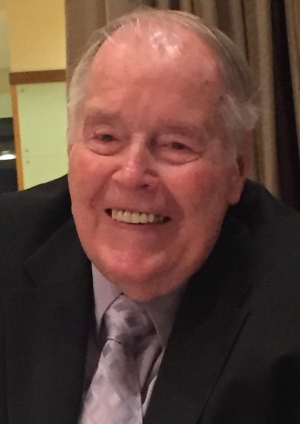 His devotion to his faith helped to guide him through his life and his commitment to Rotary was the foundation of his many years of community service to the Santa Clarita Valley. His greatest desire was to help the world, through Rotary International, by making people aware of the need to eradicate polio throughout the world and helped raise awareness of the issue through the Rotary Polio Plus program. Duane and Linda, through contributions and fundraising, were responsible for inoculating approximately 88,000 individuals throughout the world with the polio vaccine. Until just a year ago, Duane stayed active in Rotary even while dealing with many health complications caused by advancing age and his physical challenges. The recent months were indeed very difficult for Duane and he bore the burden in a stoic and determined fashion. Upon his death, Duane was surrounded by his family and loved ones. Duane touched and affected all those he met through his example of courage, determination, humility, patience, compassion for others and long suffering. His wise counsel and ability to listen was extraordinary and impactful. He will be greatly missed by all that knew him. Duane will be buried in a private family graveside service and a celebration of his life is being planned for the near future. In lieu of flowers, a contribution to the Rotary End Polio Now program in Duane’s name at the web site https://www.endpolio.org/donate is greatly appreciated by his family.